If you've lived with a cat for more than a day, you know the length of his attention span. Cats tire very quickly of anything humans think might interest them. But here's a cat toy that offers somewhat more likelihood of your cat not becoming bored too soon after you've purchased it. It's the FroliCat SWAY Magnetic Cat Toy. 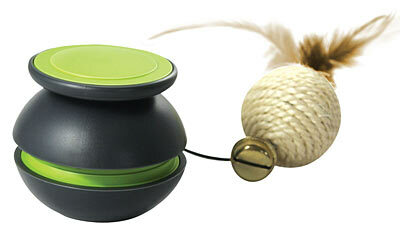 Its magnets are in the two-part black ball that can attach to a table, desk, or any ledge less than two inches thick. Hanging from it is a sisal-wrapped ball with a feather and a bell. 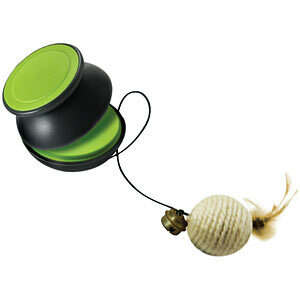 Yes, the above image seems to show three sisal balls, but there is only one attached to the actual toy. Perhaps the image was intended to show one ball in motion? Here is a closeup of the actual toy. The next image shows how the magnetic ball comes apart to be affixed to a ledge or table. The advantages of FroliCat Magnetic Cat Toy, as I see them, are that 1) you can move it around to different points of the table or ledge, possibly attracting continued interest of your cat; and 2) you can move it to different locations, say from your study to your living room. Because cats like to be where we are, you can both be in a place where you can interact with your cat and the toy from time to time. Your cat will need to be supervised when playing with the toy, so don't leave it out for him if you are not within eyesight. 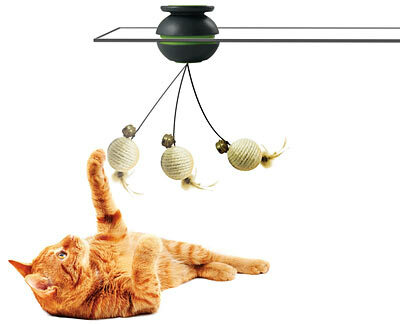 There is a chance that his paw or his nails might get caught in the string, which can traumatize him. The FroliCat SWAY Magnetic Cat Toy is available at Amazon.com.